This motorhome found us in 2014. Fall in love, bought and made the first trip within 1 week. Half of Europe traveled with the family in recent years. It is a nice cozy compact family camper from 2001. Complete and fully equipped for 5 people. Kitchen has in addition to a very extensive "standard" design with complete knife set, also the following electrical appliances: juicer, small oven, coffee maker, kettle, hand blender and pizza pan. A BBQ is supplied as standard. The camper is also equipped with games for indoors and outdoors. With a train seat (table with two double sofas) and a long sofa where several people can sit. A cozy and spacious design. Plenty of storage space in the many deep wall units and under the benches. The double floor also provides additional storage space, hardy and well insulated. The motorhome has 5 seats with a safety belt. The double bed in the alcove measures 210 x 150 cm (with fall protection), a train seat converted into a bed results in a bed of 200 cm long, suitable for two children or an adult with a smaller child (experience shows). The long couch gives a bed of 190 cm. Camper has a bicycle carrier for two bicycles (max. 40 kg total), an air conditioner in the living area. In addition, both in the living area and in the driver's cabin a radio CD player. The strong engine (2.8 TDi) easily takes you through the mountains or brings you quickly on the road to your destination. Or - even better - touring quietly. All supported by the cruise control and reversing camera. 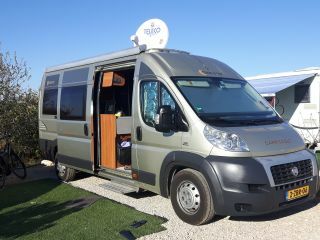 If desired, we deliver the camper for free with a separate modern TomTom navigation set. Of course with a fully up-to-date map set for Europe, with current traffic information. The annoying thing about renting a camper is that you usually do not allow pets in the camper. That means that the pets cannot go on holiday while that is just so cozy. We assume that you take care of our camper as much as you do for your own home. That is why we have no problem with it when you bring your pet / dog in the camper. Please, however, in consultation with each other whether the camper is suitable for your pet. We do not normally charge a cleaning fee because, as stated, we expect our renters to treat our motorhome with as much care as we do. 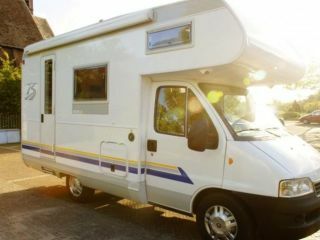 If our camper is unexpectedly not returned clean, we will charge you 95 euros for this, to be deducted from the deposit. Rental at least 1 week. Pick-up and return day in principle on Saturday but in consultation possible. Pets please in consultation to see if the camper is suitable for your pet. Full tank of diesel along, full tank of diesel on return.